This is a 14 inch, fully jointed yellow mohair teddy bear with a growler.. In 1908, Otto Steiff put together a sample collection of colored bears (green, yellow, pink and black) for the English sales representative Herbert E. Hughes. 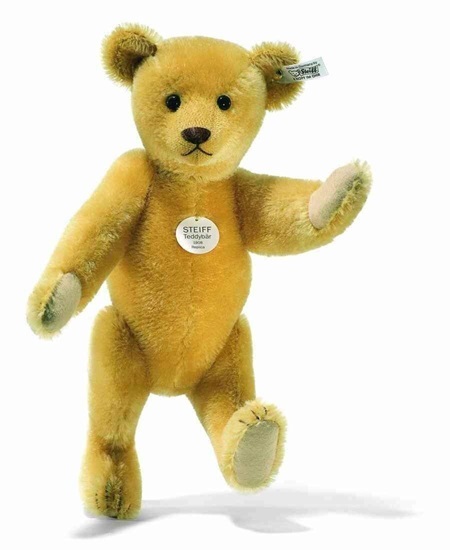 Although these bears were never marketed, Steiff did eventually produce these bears as "1908 Replicas". This Steiff 1908 Yellow Mohair Replica Teddy, EAN 406751, was released in 2006 and is made from yellow Schulte mohair and stuffed with wood shavings (excelsior). 1908 Yellow Replica Teddy is 5 way jointed and features boot-button glass eyes and a growler mechanism. This teddy is surface washable and has the white tag "Button in Ear".